Scott Hancock, 38, planned to become a lawyer after he emerged with an accounting degree in 1992 from Southern Methodist University in Dallas. That changed while finishing his MBA at the University of Arkansas at Little Rock. A job offer from banking legend Wallace Fowler led him to Jonesboro and a new career direction. "What's kept me in [banking] is working with customers and providing them with solutions," the Little Rock native said. "I love seeing other people succeed." He stayed aboard as senior vice president and credit administrator after Fowler sold Southwest Bancshares to First Commercial Corp. of Little Rock in 1997, but in 2001 he joined Fowler's new banking venture, which became Liberty Bank. Today, Hancock manages an individual loan portfolio of more than $175 million and oversees a credit portfolio of nearly $500 million and 14 lenders in seven northwest Arkansas markets. 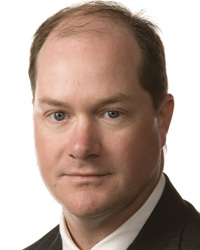 He was active with civic and charity groups in Jonesboro before moving to northwest Arkansas after his promotion to regional executive vice president in September 2005. Hancock still loves to literally play Santa at civic and charity events and remains active on the volunteerism front in northwest Arkansas.